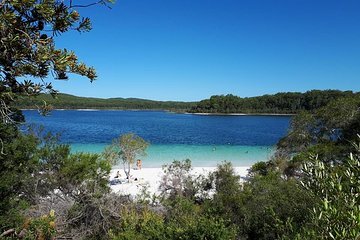 Go camping without the hassle of having to carry around your own gear or worry about preparing food, on this two-day guided camping safari on Fraser Island. Your knowledgeable local guides will drive you by 4x4 to some remote spots on the island, such as isolated beaches and lookout points. Go swimming, hiking, and spot wildlife and camp out under the stars on this well-planned trip. We haven't seen everything on the island which was planned. What we haven't done is Travel West inland or walk to Lake Boomanjin the red perched lake and Lake Benaroon Dingo, Tortoise, DolphinYidney, Dripping Rocks and also not the Night Activities and Starlight swim.the organisation was not good. We could have seen much more with a better planning. We also haven't spent lots of time on the other spots, which was really sad. Instead of this we went to the same spot twice. Unbelievable, but we were not informed to be 3 hours later back home, just because we have to pick up other people. itineraries are subject to change due to tidal and weather conditions but not for picking up other people form a total different spot! We're running all late. Some of us can't check in to the right time at there hotels. Part of the tour and also of the money is the pick up and drop off on the right time. This is unfair. The island itself is fantastic, but the tour did not have a very professional feel which I expected given the price. The 4x4 driving was not for me - it was very aggressive and felt like we were damaging the natural environment by pouring out diesel fumes. The camping was fine but would have preferred it had the guides known which sleeping bags were clean and those that were used, and that one if not both guides had stayed sober given how isolated the place was and they were the only qualified drivers. I'm sure there are other ways to get the most out of this beautiful place that give it the respect it's due. I'd go back, but not with this company. Shame, as it had a lot of potential and our guide Ret was very knowledgable.